This comment came after I posted my How to Get Rid of Forehead Wrinkles video: I never see your forehead crinkle when you talk, like most normal young people, which to me indicates Botox, even though you claim otherwise. No, angel, the foreheads of “most normal young people” don’t crinkle when they talk. Look at the children in your family. Or watch a Home Alone video – google then 10 year-old Macaulay Culkin, who played main character Kevin McCallister in the popular 1990 movie. Even in the most exaggerated expression, when his eye brows fly high, you’ll see no deep horizontal wrinkles. They’re there, all right, but they’re tiny. 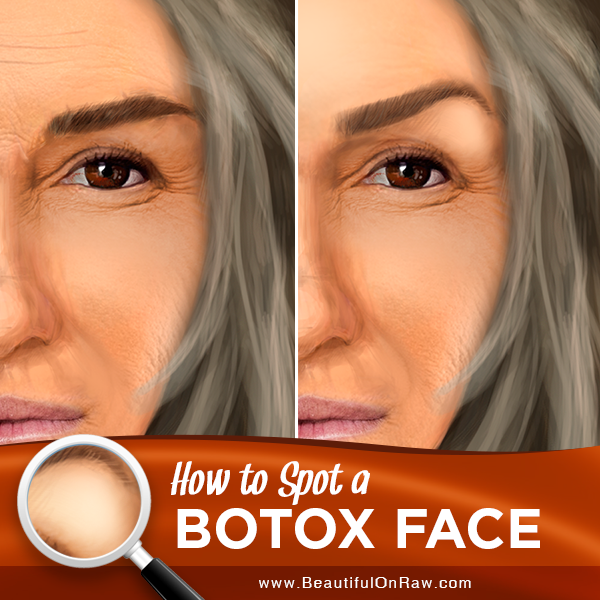 On the other hand, vertical lines spell “old.” And Botox users are all about removing them! How? By freezing your features. Botox injections block the transmission of acetycholine. When acetylcholine is blocked in nerve cells, your muscles don’t get the signal to contract. Muscles that normally fold the skin into creases stay paralyzed, so wrinkles seem as if they’ve disappeared. My correspondent got it backwards. The indication of a Botox user is not the absence of highly visible forehead wrinkles, but the absence of eyebrow movement. In the video Botox Alternatives for Wrinkles, I even made a close-up shot of exaggeratedly lifting my eye brows up. 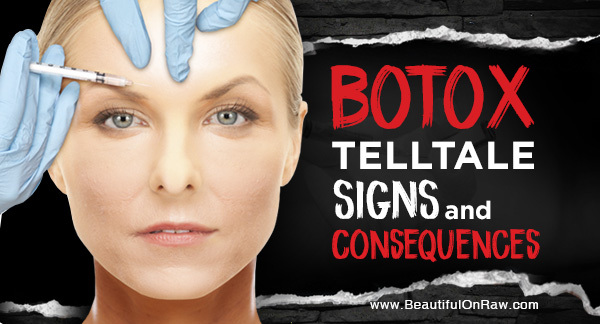 Botox severely affects your facial muscles’ ability to contract. You’ll often see, for example, eyebrows that stay still even while a person talks animatedly. Many people wonder why, after Botox injections, the forehead appears unnaturally polished and shiny. Looking for an explanation of this shiny effect, I came across a striking analogous explanation in the account of the gum disease gingivitis: “[t]he gums may appear shiny when the gum tissue becomes swollen and stretched over the inflamed underlying connective tissue…” Could it be that something similar is happening in the case of Botox injections? On some women you can indeed see the red hue, characteristic of inflammation. Most people arch their brows when they talk—the brows go up and down. Botox users’ brows, however, often become overarched and stay so all the time. Botox injections stretch the skin unnaturally from the inside. Though the goal is to smooth away lines and wrinkles, Botox doesn’t actually remove either of these conditions. Wrinkles in other places will stand out much more, because of this smooth, mirror-like background. Also, your décolleté area and neck creases now will stand out more and give away your age. On a first use, it takes a week for Botox to kick in. After the initial week, you get more confident with your smooth face for a period of time. And then... It wears out. Now the contrast of how you did look, compared to how you do look becomes more dramatic to you… and everyone else. Every Botox user is a “slacker,” in a sense. Say you see a person with a smooth, taut face. Then, with passing weeks, the person’s face slackens, becoming more and more sluggish looking. There’s this person in my fitness class… makes me sad. She comes to exercise only when her Botox is fresh. Then she disappears for a month or so during her “slack” period… freshens up… returns… disappears again. Consider what makes a face “charming.” It’s facial expression. Which means: It’s all that’s happened to that face—its life experience, including those little creases. Botox can create a temporary glamour that works from a distance. But it’s a glamour that—so long as it lasts—removes all charm. The idea is to look younger. Trouble is, the injections make you look like an older person who’s trying awfully hard to look young. They give the face an unnatural appearance, creating frozen, unyielding expressions. If you look at a person and something looks strange, or something seems wrong… it probably is! What do people usually do when they see a face that looks a little… strange? They tend to stare at that face to see whether its owner has “done something.” Not an admiring glance. Looking closely, they begin to see things that betray the person’s age: taut facial expressions, wrinkled hands, neck, eyes, and elbows, stiffness in the way they walk and talk. In the end, even with the best outcome, people will not be impressed by the Botox user's looks, but by the doctor’s skills. They might manage to say, “Oh, you look great!” But don't be mistaken. What they really mean is: "What a great Botox job." Now here’s the kicker: If you eat well and you’re active, your Botox will fade faster. You’ll heal faster and your body will work fast and hard to cleanse that crap from your system. If you eat mostly raw and use Botox, you’ll – at best – be wasting money. Worse, you might be way more susceptible to toxins than a person on a “normal” diet. It’s like smokers and non-smokers… A healthy nonsmoker’s body reacts much more negatively to the poisons in cigarettes. And then there’s the magic of turning 50. Around that age, skin blemishes start showing, with or without Botox. Suppose you’ve been getting Botox injected for some years. Imagine, then, how your injections spots will start revealing themselves on your face. Toxins from inside begin showing their ugly heads in a myriad of skin imperfections—moles, discolorations, broken capillaries. In fact, a woman’s face after years of use of Botox will look like a battle field, making it impossible to appear in public without makeup. Once the injections wear off, the skin will actually look more wrinkled than before! With age, you’ll need more and more units of Botox to get the effect you had last year. The cosmetic-procedures industry has, in effect, trained us to see this smooth, stretched, frozen tissue as a “perfect” skin condition and to seek it as an ideal. Because of this, Botox can very quickly become an addiction. And just the same as with drugs, if not stopped, it cannot have a happy ending. The day comes when you’ll regret having done it. Ever. Maybe after the first time. Maybe the tenth. But sooner or later it will happen. Natural Skincare is Inconsistent with Botox. It’s important to understand that all my beauty products and practices—dry brushing, masquing, masque removal with the brush, RejuvaRoll, knuckle massage, Strigil scraping, RejuvaCup and the like, involve vigorous treatment of the skin and its underlying tissues, which is a no-no with Botox and cosmetic fillers. My skincare practices will be helping your body to pull foreign things out from the body. Cosmetic procedures such as Botox, fillers, and injections are bringing something foreign in. All such injections and fillers are made to stay in the allotted place and not migrate to the “wrong” area. Conversely, the natural methods that I recommend move fresh blood to your face and stimulate your body’s own miraculous healing resources in order to rejuvenate. For example, the RejuvaCup definitely goes counter to what your cosmetic doctor is trying to accomplish—it will try, in effect, to undo what he’s done. Most young people don’t have deep vertical lines on the forehead, even if they talk animatedly. Neither do I. What has made the difference? I’ve been using paper tape and WrinkAlign Forehead Liners for several years. Those are doing an exceptionally good job in crease-smoothing and preventing forehead wrinkles. WrinkAlign Liners will make your forehead look polished and smooth, but they will not paralyze your features and have no negative side effects. This particular wrinkle ages a face most. Why? Because it signals a long life of frowning. And, behind that, a long life of discontent toward people and toward life. Unlike the vertical lines on your forehead, you can entirely control your forehead furrow. What to do: Just don't frown! Read my first book, Your Right to Be Beautiful. There I explain how I’ve trained myself to avoid exaggerated facial expressions that create wrinkles. The earlier you start, the better. Your forehead needs help. Emotional help, frankly. Your best medicine: being kind and trusting toward people and life in general. 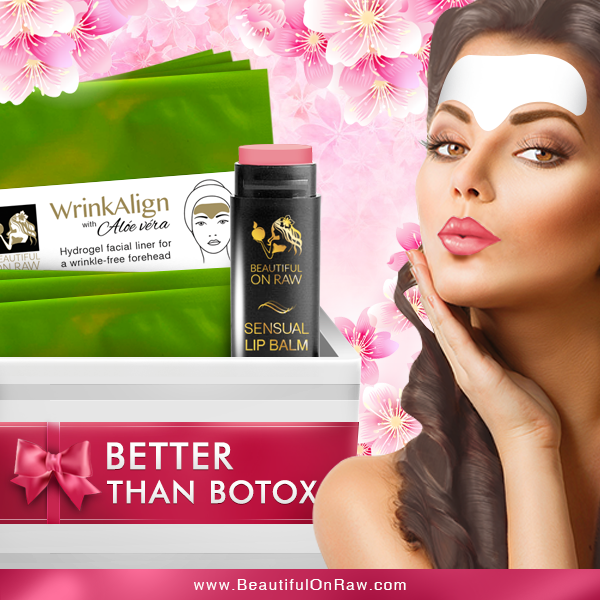 Regular use of WrinkAlign Liners on your forehead will also free you from the habit of constant frowning. Read more in the article How to Prevent Forehead Wrinkles. Now we’ve added extra cinnamon oil in our Sensual Lip Balm. You’ll experience increased circulation and revitalized blood flow in your lips. The presence of mica—a translucent, shimmering silicate mineral, brings enhanced color and sheen. No need for Botox injections. No need to make your lips grotesquely big (your lips shouldn’t arrive before you do…). This increased cinnamon oil concentration in our new Sensual Lip Balm will bring a youthful plumpness to your lips—naturally! No! I don’t go for cosmetic procedures. I’ll stick to what’s natural. Prevent what I can, accept what I can’t. With this attitude, and the help of my WrinkAlign, I am more than fine.